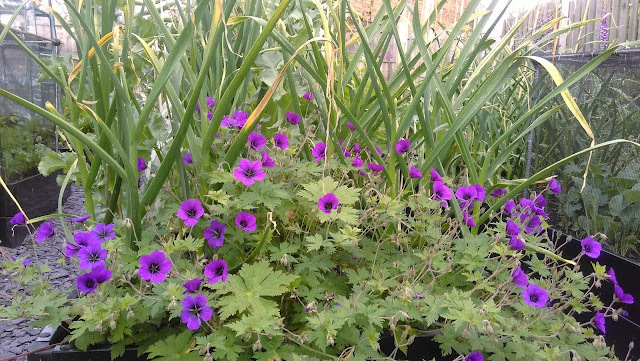 The eagle-eyed among you may have noticed that there wasn't a June #GardeningWithME post, and that in general, I've not been blogging quite so much. When you garden with ME or another chronic illness, it not only means you have to garden more slowly and be careful where you spend your limited energy. It also means there are periods when you cannot garden much, if at all. This is one of those times for me. My ME has got worse recently and I'll confess it feels like it's a bit of a struggle to manage the garden. 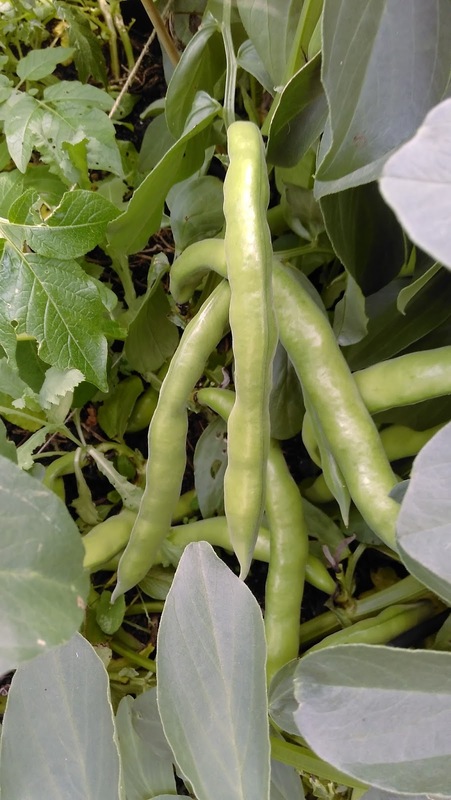 Which is frustrating as of course now is when the kitchen garden is starting to produce at an accelerated rate, and the flower borders are bursting, and falling over, at the edges. My health, in turn, has had an impact on my blogging about the garden and related topics. I have posts I want to write, on garlic, on the herb bed, on a recent visit to Scampston Walled Garden and the North York Moors. But I haven't had the energy. In fact, I'm at the point now where I have to decide whether to spend my limited spoons* (energy), when I have it, to blog about gardening, or getting something done in the garden. For now, being in the garden, enjoying it, harvesting and cooking the produce, is taking priority. And all my remaining energy. Even then, I only get to garden if I have enough energy after doing some studying (I'm doing a long-distance bookkeeping course) or trying to undertake daily tasks such as having a shower (who knew taking a shower used up so much energy?!) or doing the dishes. 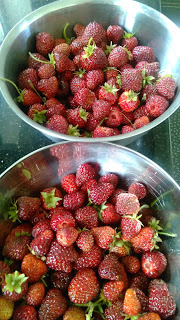 Yesterday, I picked about 1.5kg of strawberries. It was great to be out there in the garden, in the sun, with strawberries. But it was also exhausting. I had no energy to do anything with the strawberries and went to bed. 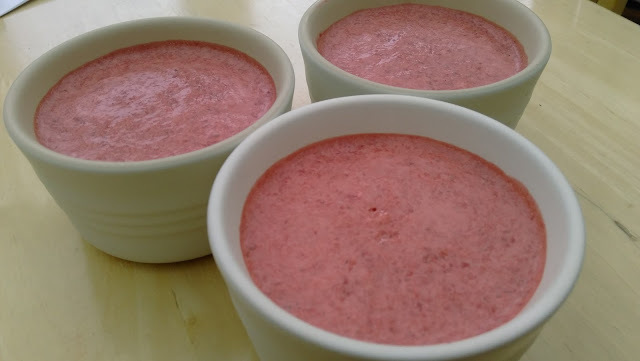 Today, my one goal, was to make strawberry ice cream. Which I did, then I went to bed. You get the idea. So the blog is going to take a bit of a back seat for a while; hopefully not too long. I hope, and am trying my best to manage things, so that this worsening of the ME is only temporary and I'll still get to write those posts on garlic etc. When you are gardening with ME, sometimes there aren't enough spoons to both garden and blog about gardening. Any gardener will understand. If it a toss up between being in the garden or writing about the garden, being in it wins every time. *If you don't know about spoon theory, I highly recommend this article by Christine Miserandino, from where it originates. Your ice cream looks wonderful, and I'm sure tasted wonderful too. Do take care of yourself, of course gardening is more important than writing about it. I'm having to learn to adjust, every 10 minutes or so, I change to jobs that use different sets of muscles and that seems to be working so far. I do the 10 minute thing too, which I find helps. It's surprising what you can do in 10 minutes slots! I don't have a chronic illness and I find it difficult enough to summon up the energy for everything I want to do in the garden and beyond. So I'm in awe of you and your garden. I reckon you certainly deserve to relax with some of that lovely looking ice cream. I get to feeling terrible at this time of year, with garden openings, coach parties and gardening on top of all else and wonder if I really ever did recover from ME - though at my best I assume I have done. It certainly makes me feel for you either way, because I can remember vividly how bad it was when this was chronic and worse. I notice how it drains the pleasure out of good things. Thanks Anne. Yes, the ME can drain so much pleasure from life and I'm determined it won't take away my pleasure of gardening. Even small does of gardening lifts my spirits. That ice-cream looks amazing! This year I decided not to do tomatoes due to spoons + constant battle with botritis in the greenhouse. Every year the tomato crop tires me out in a way other things just don't. I've noticed this year that the other crops are doing little better because they've got a look in. I'd not really appreciated just how 'spoon hungry' the tomato crop was. In future, beyond the odd tumbling variety on the patio, I might just do without. My strawberries on the otherhand were SO much easier to look after and gave up loads and loads of fruit. I think they are a fab crop for gardening with ME/Chronic illness! You post is making me think I should look at my growing choices all over again. I've not really been properly mindful how energy hungry each crop is. I wonder if one could come up with spoon rating for crops. Tomatoes = 5 spoons, Strawberries = 1 spoon, Runner beans = 1 spoon etc etc :) Ingrid. I do sympathise, what you are achieving, not to mention sharing with others given the ME is amazing. Thanks for the 'spoons', what a brilliant metaphor for the difficulties of living with a chronic condition. Take care. Thanks Kate. It's great that something like Spoon Theory helps people who aren't chronically ill understand. In fact, some non-spoonies use it to help them manage life when it's 'time poor' too. You are doing what's right for you Julieanne and there is no gardener on this planet would sacrifice actual gardening time for writing about it. I hope your current bout is a temporary thing and you'll get a little respite soon. Take care and looking forward to seeing you back just as soon as. Best of luck with your bookkeeping course. I managed to do AAT level 2 last year and really enjoyed it. I hope your ME gives you a break soon. I've taken to recycling previous posts as I've been struggling to keep up with blogging (and gardening) too - but I think you've just inspired a future ME- related post! Thanks Tim. I will get there with the course, just slowly. Yeh, mayby I should recycle some posts too. In the meantime, I look forward to your next ME post. I have resorted to blogging twice a month and it works for me, GBBD and EOMV are memes I enjoy so I post for them. I hope you feel better soon and have nice weather to enjoy the garden. It’s raining here today. Yippi!! Finally a whole day of rain, we haven’t had that since….I don’t know….February maybe. Good for my garden. Have a great week-end.